Serena Williams has withdrawn from the Miami Open because of a left knee injury. It is the second consecutive WTA event in which the American eight-time champion has been unable to continue, after her retirement from last week’s tournament in Indian Wells with a viral illness. “I am disappointed to withdraw from the Miami Open due to a left knee injury,” the former World No 1 said in a statement. The 23-time Grand Slam winner was set to face Wang Qiang in the last 32 but the Chinese player will progress with a bye, having beaten British No 1 Johanna Konta in the second round. 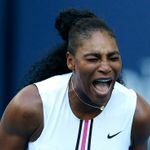 Williams has been impressive at the Grand Slams since her return following the birth of her daughter but she has struggled to match an impact on the WTA Tour, winning just five matches in six tournaments. The world No 1 came close to losing to the unconventional Hsieh at the Australian Open but this time she could not finish off the job despite leading by a set and 5-3. The 18-year-old Canadian, who became one of the most unexpected champions of recent years when she won the title and beat Kerber in the final in the Californian desert prevailed 6-4 4-6 6-1 to maintain her winning record against top 10 players this year.